Animals - Visual Dictionary - Copyright © 2005-2016 - All rights reserved. 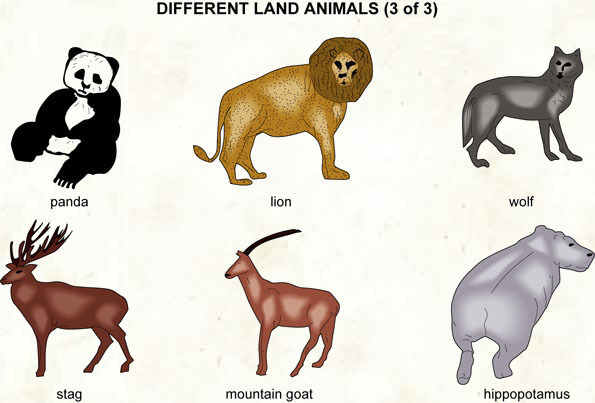 [img]https://infovisual.info//storage/app/media/02/img_en/080 Different land animals 3.jpg[/img] [url=https://infovisual.info/en][/url] - [url=http://www.infovisual.info/]Visual Dictionary[/url] - Copyright © 2005-2016 - All rights reserved. Different land animals (3 of 3): animals living on solid ground. Panda: cousin of the bear that lives in the forests of India and China. Lion: large feline which inhabits the African savannahs. Wolf: canine native principally to Europe, Asia and the Americas. Stag: large cervine native to the forests of Europe, Asia and the Americas. Mountain goat: small wild ruminant that lives in the mountains. Hippopotamus: heavy porcine mammal that lives in Afriacn rivers. Domestic goats are one of the oldest domesticated species. For thousands of years, goats have been used for their milk, meat, hair, and skins all over the world. Most goats naturally have two horns, of various shapes and sizes depending on the breed. While horns are a predominantly male feature, some breeds of goats have horned females. Polled (hornless goats) are not uncommon and there have been incidents of polycerate goats (having as many as eight horns), although this is a genetic rarity thought to be inherited. Their horns are made of living bone surrounded by keratin and other proteins and are used for defense, dominance, and territoriality. Goats are ruminants. They have a four-chambered stomach consisting of the rumen, the reticulum, the omasum, and the abomasum. Goats have horizontal slit-shaped pupils, an adaptation which increases peripheral depth perception. Because goats' irises are usually pale, the pupils are much more visible than in animals with horizontal pupils but very dark irises, such as sheep, cattle and most horses. Both male and female goats have beards, and many types of goats may have wattles, one dangling from each side of the neck. Some breeds of sheep and goats appear superficially similar, but goat tails are short and point up, whereas sheep tails hang down and are usually longer, though some are short, and some long ones are docked.